We are gearing up for our first two concerts of 2019, the first of which brings us back to our hometown for the first time in about two years. Wednesday, March 13th at McGuinn's Place, Lawrenceville, NJ, with Nemesis and The New Masters of Evil. Next up, we are pleased to announce that we will be supporting the mighty Flotsam & Jetsam once again, alongside Attacker, Fiakra, Deth Kaktus, and Vision Serpent. 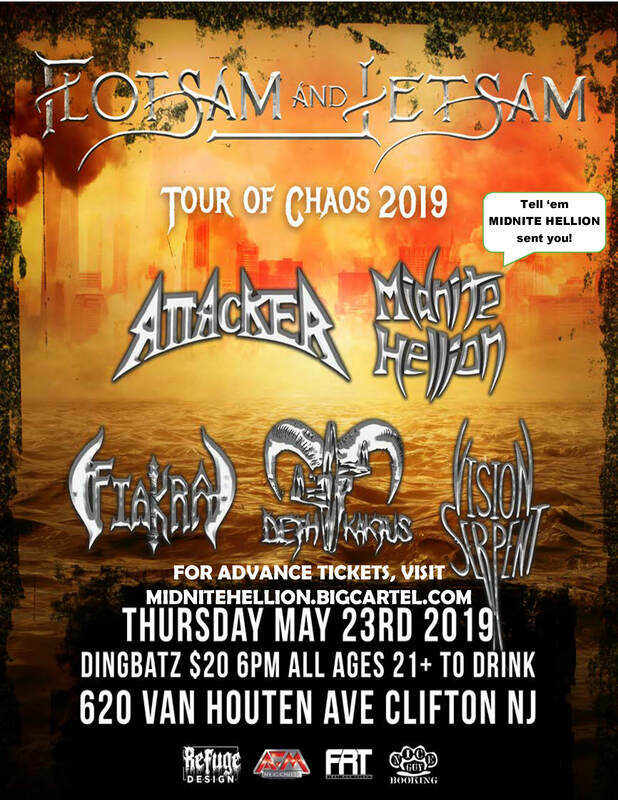 Thursday, May 23rd at Dingbatz, Clifton, NJ. Discounted tickets are now available for $20 each, free shipping. We have two options available - you can either have physical tickets mailed to you, or you can print at home. Click here to order. Looking forward to seeing our Jersey faithful once again!